What is Purchase Price Allocation? In acquisition accounting, purchase price allocation is a practice in which an acquirer allocates the purchase price into the assets and liabilities of the target company acquired in the transaction. Purchase price allocation is an important step in accounting reporting after the completion of a business combination deal (e.g., merger or acquisition). The currently accepted accounting standards such as International Financial Reporting Standards (IFRS)IFRS StandardsIFRS standards are International Financial Reporting Standards (IFRS) that consist of a set of accounting rules that determine how transactions and other accounting events are required to be reported in financial statements. 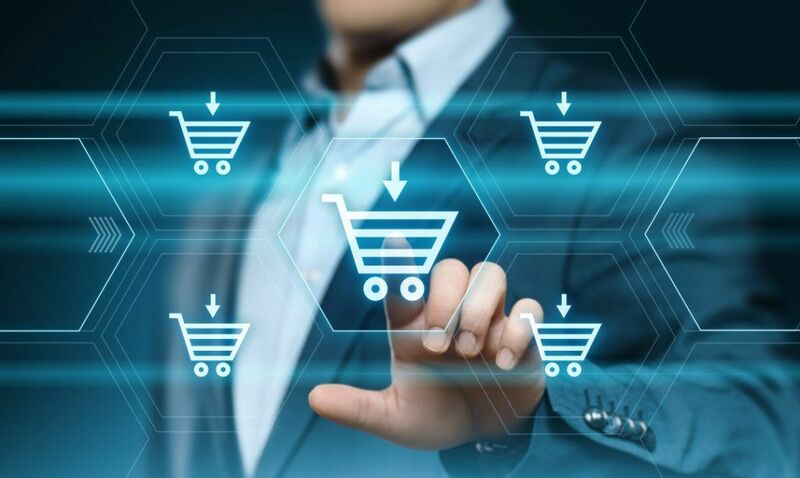 They are designed to maintain credibility and transparency in the financial world require employing the purchase price allocation method for any type of business combinations, including both mergers and acquisitions. Note that past accounting standards required purchase price allocation only in acquisition deals. Nowadays, in both mergers and acquisitions, an acquirer and target company must be specified to perform purchase price allocation. Net identifiable assets refer to the total value of assets of an acquired company less the total value of its liabilities. Note that the identifiable assets are the assets with a certain value at a given point in time and whose benefits can be recognized and reasonably quantified. Essentially, the net identifiable assets represent the book value of assets on the balance sheet of an acquired company. It is important to understand that the identifiable assets include both tangible and intangible assetsIntangible AssetsAccording to the IFRS, intangible assets are identifiable, non-monetary assets without physical substance. Like all assets, intangible assets are those that are expected to generate economic returns for the company in the future. As a long-term asset, this expectation extends for more than one year. A write-up is an adjusting increase to the book valueBook ValueBook value is a company’s value as recorded by its financial documents. The book value figure is typically viewed in relation to the company’s stock value of an asset made if the asset’s carrying value is less than its fair market value. In other words, if the book value of an asset on the balance sheet is less than its fair market value, the write-up is used to equalize the asset’s book value to the fair market value. The write-up amount is determined when an independent business valuation specialist completes the assessment of the fair market value of assets of a target company. Essentially, goodwill is the amount paid in excess of the actual amount paid for the purchase of target company assets and liabilities over their total value. Goodwill is calculated as a difference between the purchase price and the total value of assets and liabilities of an acquired company. From an acquirer’s perspective, goodwill is critical in its accounting reporting because both US GAAPGAAPGAAP, or Generally Accepted Accounting Principles, is a commonly recognized set of rules and procedures designed to govern corporate accounting and financial reporting. GAAP is a comprehensive set of accounting practices that were developed jointly by the Financial Accounting Standards Board (FASB) and the and IFRS require a company to re-evaluate the recorded goodwill at least once a year and record impairments if it is necessary. However, it is critical to remember that goodwill is not depreciated over time. Note that acquisition-related costs – including but not limited to various legal, advisory, or consulting fees – are not considered in purchase price allocation. According to accounting standards, an acquirer must expense the costs whenever they have been charged while the corresponding services have been provided. Company A recently acquired Company B for $10 billion. Following the completion of the deal, Company A, as the acquirer, must perform purchase price allocation according to existing accounting standards. The book value of Company A assets is $7 billion, while the book value of the company’s liabilities is $4 billion. Therefore, the value of net identifiable assets of Company B is $3 billion ($7 billion – $4 billion). The assessment of an independent business valuation specialistBusiness Valuation SpecialistBusiness valuation refers to the process of determining the actual value of a business. Owners work with a business valuation specialist to help them obtain an objective estimate of their business's value.They require the tap the services of business valuation specialists to determine a business's fair value, determined that the fair value of both assets and liabilities of Company B is $8 billion. The fact implies that Company A must recognize a $5 billion write-up ($8 billion – $3 billion) to adjust the book value of the company’s assets to its fair market value. 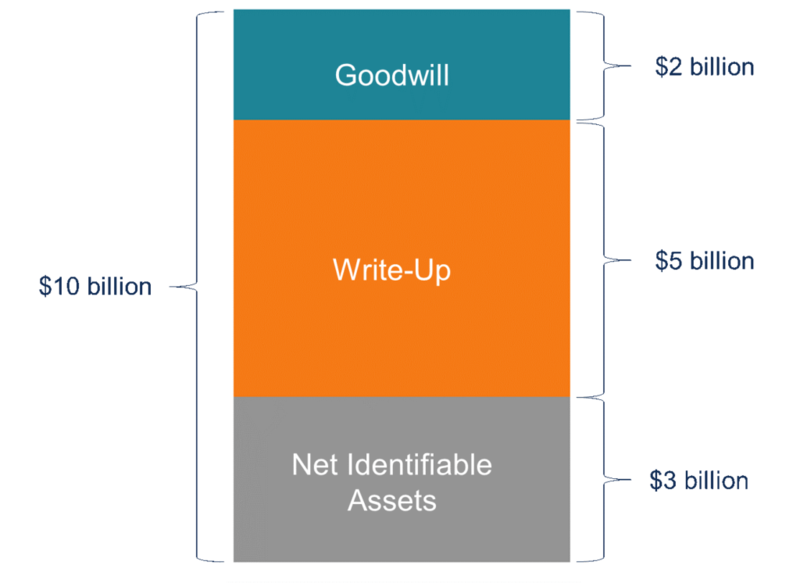 Finally, Company A must record goodwill since the actual price paid for the acquisition ($10 billion) exceeds the sum of net identifiable assets and write-up ($3 billion + $5 billion = $8 billion). Therefore, Company A must recognize $2 billion ($10 billion – $8 billion) as goodwill.